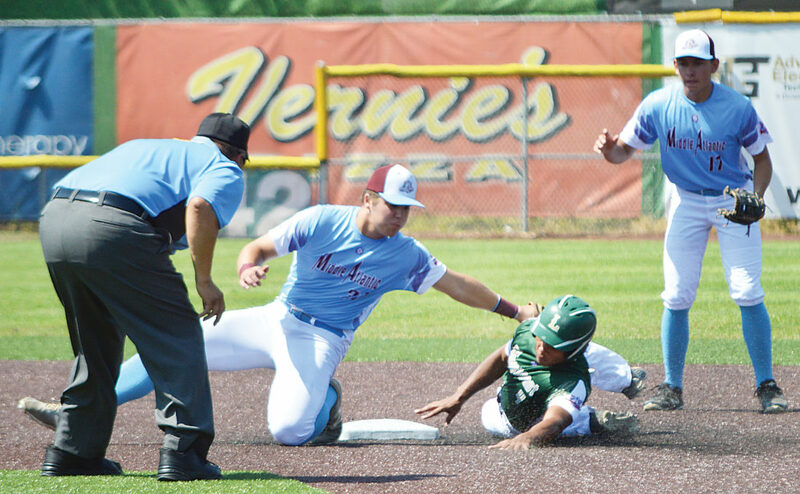 Tallahassee runner Will Brown, right, is tagged out trying to steal second by Mifflin County shortstop Brian Yetter, left, on a throw from catcher Jaxson Pupo in the first inning Friday at the Babe Ruth World Series in Longview, Wash. Bryce Dobson (17) looks on. Mifflin County’s Ethan Eichhorn, right, celebrates as he scores the first run for his team in ront of Tallahassee catcher Hayden Kelley. 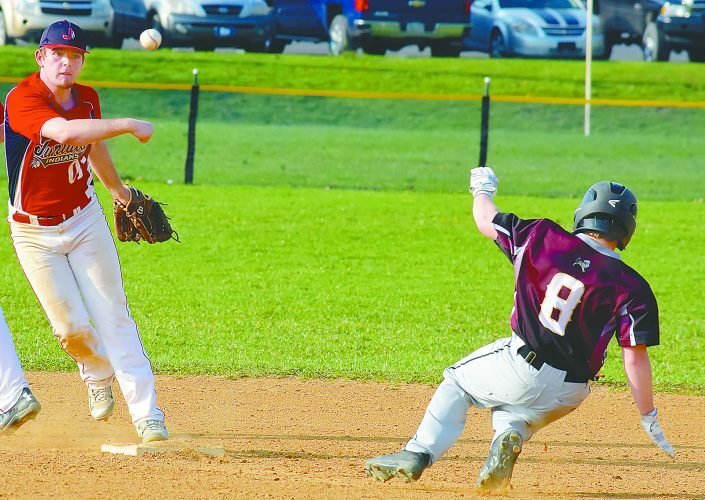 Mifflin County’s Brian Yetter (33) beats the throw to first for an infield single as Tallahassee first baseman Cooper Smith stretches for the ball. 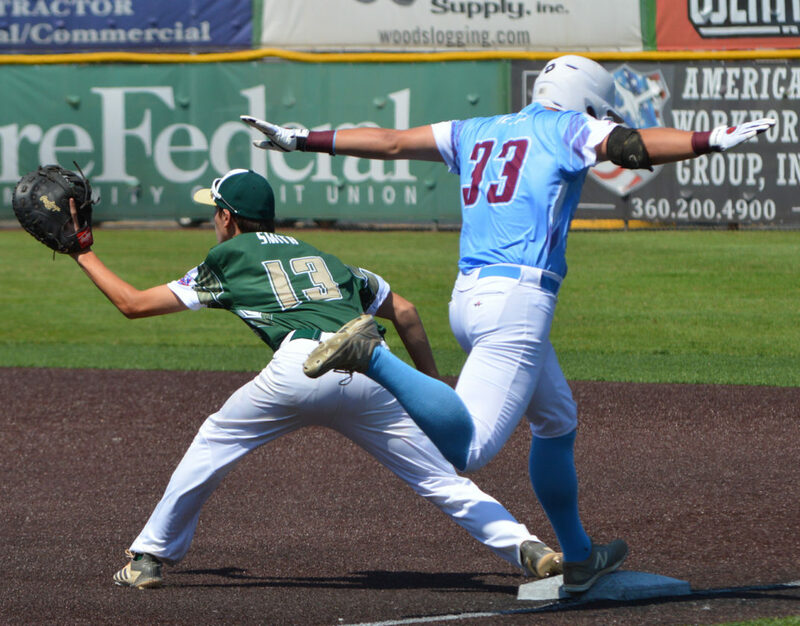 LONGVIEW, Wash. — Jaxson Pupo changed the first game of the 2018 15-year-old Babe Ruth World Series for Mifflin County with his arm and with his bat. 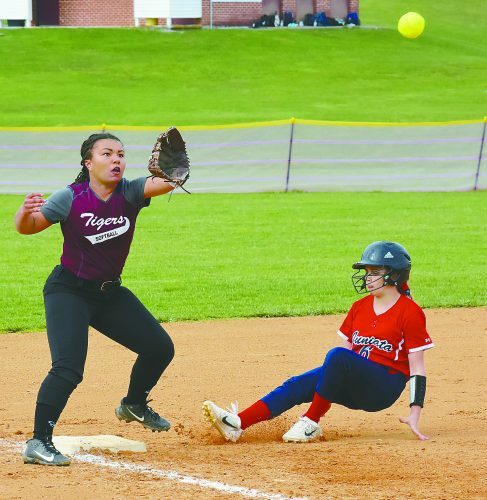 Mifflin County beat Tallahassee, Florida (Southeast region), 3-2 on Friday afternoon. Mifflin County will play today in its second game in pool play against Torrance, California (Pacific Southwest) at 4:30 p.m. Both of Pupo’s feats came in the first inning. Tallahassee had two run across the plate and no outs with Will Brown at first base. Brown made an attempt to steal second and Pupo threw him out for the first out of the inning. From that point on it was all Colby Bodtorf on the mound. Mifflin County tied the game in the bottom of the opening frame. Bodtorf made the first out, but Brian Yetter singled. Ethan Eichhorn reached on a fielder’s choice. Casey Conner walked and Brycen Hassinger kept the inning alive with a base hit. Pupo then smashed a two-run single to tie the game. 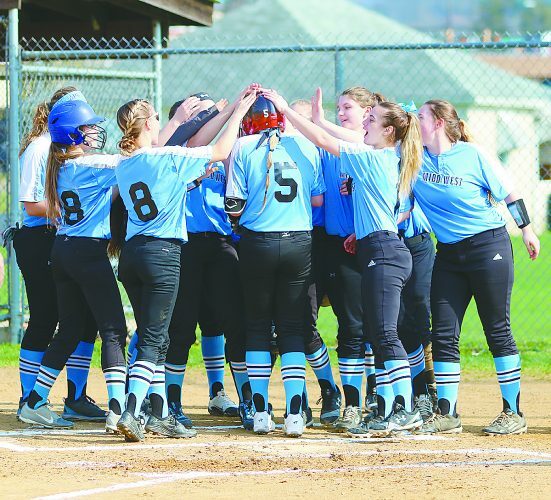 Mifflin County scored the go-ahead run — and what turned out to be the game-winning run — in the bottom of the second inning. Bryce Dobson walked to start the second. Cole Schlegel reached on a fielder’s choice. Bodtorf singled and both runners advanced on a wild pitch. After a strike out, Eichhorn came up with a run-scoring base hit. From that point on it was Bodtorf on the mound. After the shaky start, he retired nine men in a row. He allowed four hits, walked one batter and hit a batter. He finished with six strikeouts. The first two men for Tallahassee reached to start the sixth inning. Bodtorf had to leave because of his pitch count was at its highest level. Yoder went to the bullpen and he called on Connor Cherry. Cherry struck out the first man he faced, but Tallahassee’s A.J. Throup singled to load the bases. Cherry got Argene Lynn to pop out to Bodtorf, who was now playing shortstop, and finished the inning by getting Cooper Smith on a hard liner back to the mound. In the seventh inning, Tallahassee got its first two men on base as Logan Melvin opened with a double and Hayden Kelly bunted for a single, leaving runners on the corners. Cherry then got a pop out to shortstop, a strike out and the game ended with a fly ball to center field gloved cleanly by Yetter. Mifflin County finished with eight hits with Pupo and Yetter each getting two; Pupo went 2-for-2 and added two RBIs. Eichhorn plated the other run. Schlegel had the lone extra-base hit, a double, for Mifflin County. Tallahassee’s pitchers managed only three strikeouts and issued four walks in the game. The Southeast team did have on more hit than Mifflin County. 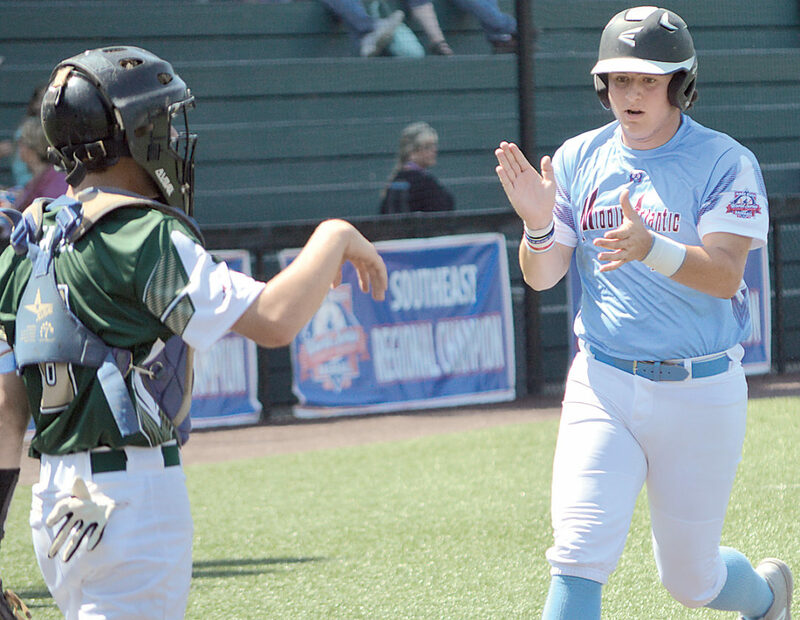 Notes: Mifflin County is now 3-1 in opening games of the Babe Ruth World Series. Mifflin County is 2-0 in 15-year-old openers in Washington. The other opening win came in Ottumwa, Iowa in 2016, in the 13-year-old Babe Ruth World Series. 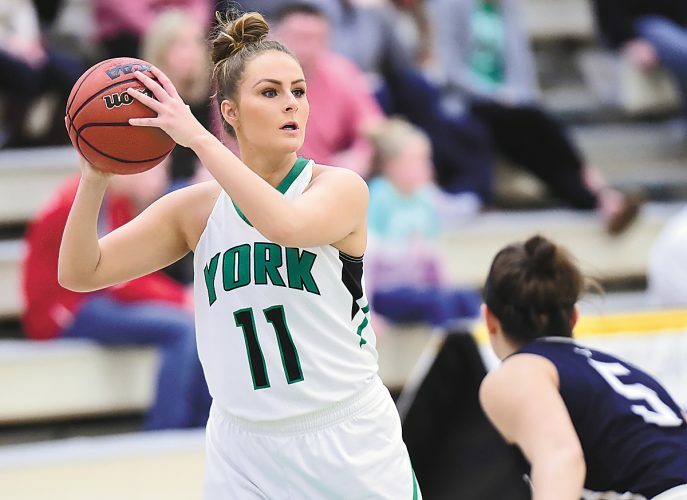 … It was the first win for Mifflin County against a Southeastern team at the national level. Mifflin is now 1-1 against Florida. Mifflin County does own a victory against Virginia, but it came in the 1960 Mid-Atlantic Regional. Including the win over Virginia, Mifflin County is now 2-1 against the Southeast. … Hunter Wolfley was sent into pinch run for Casey Conner in the fifth inning. It marked the first time that a Beaver Springs player was in a World Series game. … This was Mifflin County’s 990th game. It now has a record of 690-300 and it was the 10th Babe Ruth World Series win (10-6).